Christmas Eve Day, I gave in to the terrible temptation the post office had delivered to my door two weeks ago and finished unwrapping my Book Blogger Holiday Swap loot. As I suspected, the cookbook was indeed Andrea Chesman's Serving Up the Harvest: Celebrating the Goodness of Fresh Vegetables. I've borrowed my library's copy too many times to count and thus am very pleased to now have a copy of my own. I strongly recommend you try borrowing this cookbook from your library -- either the paperback edition, Serving Up the Harvest, or the hardcover edition, The Garden-Fresh Vegetable Cookbook. You will not be disappointed -- “Baked Tomatoes with Goat Cheese" is one of my favorite recipes, but I've never made a recipe from this cookbook that wasn't a success. The other book turned out to be Julia Strachey's Cheerful Weather for the Wedding. I've been wanting to read this novella ever since I read Jessa Crispin's review on NPR. What can I say? There's just something about a rum-swigging twenty-three year old bride with cold feet that takes my fancy. My gifts were sent to me by Gayle of Everyday I Write The Book. Thank you, Gayle, for such marvelous books! 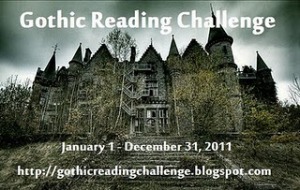 Even though the Gothic Reading Challenge doesn't officially begin until 1 January, I've already started. Oh, I didn't mean to. No, indeed. I was just on Amazon, looking for something short and free to read on my phone, when Oscar Wilde's The Canterville Ghost just leapt off the screen. The owl beat against the window panes, the raven croaked from the old yew-tree, and the wind wandered moaning round the house like a lost soul; but the Otis family slept unconscious of their doom, and high above the rain and storm he could hear the steady snoring of the Minister for the United States. He stepped stealthily out of the wainscoting, with an evil smile on his cruel, wrinkled mouth, and the moon hid her face in a cloud as he stole past the great oriel window, where his own arms and those of his murdered wife were blazoned in azure and gold. On and on he glided, like an evil shadow, the very darkness seeming to loathe him as he passed. Once he thought he heard something call, and stopped; but it was only the baying of a dog from the Red Farm, and he went on, muttering strange sixteenth-century curses, and ever and anon brandishing the rusty dagger in the midnight air. One of my local libraries has The Canterville Ghost in audio and I'm hoping to get my hands on it before Christmas, as I'm sure it would be a lot of fun to listen to! This year, my usual warm, fuzzy Christmastide feelings are struggling and I've yet to attain the snuggle-y, comfortable sort of domestic bliss I crave this time of year. Indeed, I'm feeling a bit restless, stabbity, and ... well ... a little bit "humbug." As such feelings cannot be tolerated, I have been engaging in intense bouts of literary therapy. Basically, I have been re-reading all the Christmas chapters from the Little House books. I started with Little House in the Big Woods and am now as far as By The Shores of Silver Lake and I think my "therapy" is working ... I do feel a bit more Christmas-y. I am also pretty darn hungry. First, there was oyster soup. In all her life Laura had never tasted anything so good as that savory, fragrant, sea-tasting hot milk, with golden dots of melted cream and black specks of pepper on its top, and the little dark canned oysters at its bottom. She sipped slowly, slowly from her spoon to keep that taste going over her tongue for as long as she could. When the last of the soup was gone, and the last crackers divided and crunched, there were hot biscuits with honey, and dried-raspberry sauce. And then a big dishpan full of tender salty popcorn, that had been keeping hot on the back of the stove. Oyster soup (or stew) is mentioned in four different Little House books -- On the Banks of Plum Creek, By the Shores of Silver Lake, The Long Winter, and Little Town on the Prairie! 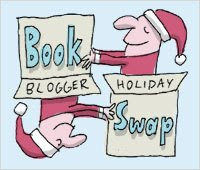 I signed on for the Book Blogger Holiday Swap 2010 as last year's swap was so much fun. This year's victim likes owls and I had a lot of fun shopping for her -- I didn't realize how hot owl stuff was until I started looking and then it was just *pow* owls everywhere! Well, at least on etsy. Perhaps, crafty people have a thing for owls? She also likes young adult fiction and, as soon as I saw her book list, I knew exactly which book I needed to give her. Santa says, "Everyone gets books from the Chaos Walking series for Christmas this year." (Seriously, my dad, mother-in-law, and best friend are all getting copies of The Knife of Never Letting Go). Yes, the post office was nice enough to do a little unwrapping for me and I know, without a doubt, that the bottom book is Andrea Chesman's Serving Up the Harvest. Thanks, USPS, for spoiling the surprise! The question is, since my presents are already (mostly) unwrapped, should I finish unwrapping them? Or should I wait? Presents now or presents later? 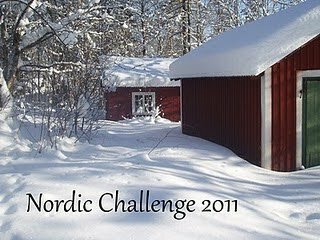 Zee from Notes from the North is hosting a Nordic author reading challenge and I've signed up! I blame this on Wallander, I really do. We've been borrowing episodes of the BBC series from Netflix and it has made for interesting watching -- interesting enough that I've been itching to try the novels that inspired them! Now I have the perfect excuse (as if I really needed one). There is no need to make a list before hand. Any book by any author born in a Nordic country (Denmark, Finland, Iceland, Norway and/or Sweden) or a book set in a Nordic country. They can be from any genre (I will be reading a mixture of classics, children’s books, YA and mystery). Can anyone tell me why there so many Nordic crime novels? Or is it just that a preponderance of Nordic crime novels make it to the American market instead of, say, poetry or science fiction? 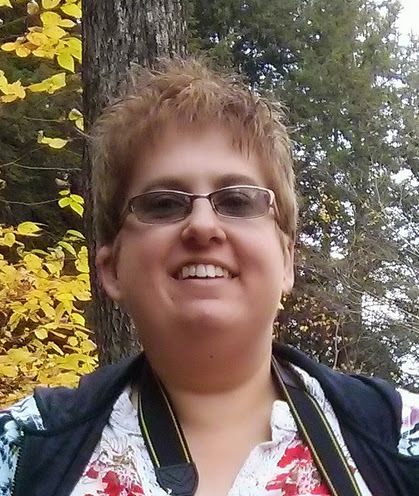 I've signed on to participate in the GLBT Challenge in 2011. 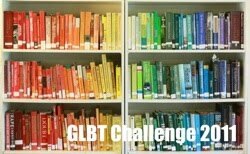 The idea behind the challenge is simply to read more books by LGBTQ authors or about LGBTQ issues and, obviously, I think that is a very good idea. (But then, you know, I'm a bit biased). As a college sophomore, I read and re-read Bledsoe's Working Parts so often that I pretty much have it memorized. It remains one of my favorite coming of age stories and I will nevernevernever loan my copy to anyone. Aud Torvingen returns! *swoon* I loved the first Aud Torvingen book, The Blue Place, and did mean to carry on with Stay ... but the world is full of books and I am so very easily distracted. Anyway, every darn time I see a Stieg Larsson novel go by on interlibrary loan, I am reminded that I still don't know what happened to Aud and I should borrow a copy of Stay. So I have. Finally. A few weeks ago, I bought an Android OS smartphone. Besides playing too much Angry Birds on it, I have been reading free books using Kindle for Android. Yes, because I don't get enough "free" books from my library. While prefer physical books to digital ones, Rebecca of Sunnybrook Farm on my phone takes up a lot less room in my handbag than a paperback does and I always remember to stuff my phone in my bag, but I don't always remember to do so with a book. This means there have been too many occasions lately where I went somewhere hideously dull and, having optimistically misjudged the amount of time I will spend there, neglected to bring a book. But now I have books on my phone and otherwise mind-numbingly boring hours are guaranteed to fly by! Seriously. All the hours I've pissed away in the ER these last few weeks? They would have been utterly unbearable without Understood Betsy. I own a beautiful hardcover edition of A Girl of the Limberlost, but it's too cumbersome to read on my lunch break. Also, I'd worry about smudging the pages with my sandwich-y hands. My smartphone wipes clean, you know! I also installed the Overdrive Android Audiobook app so I could download digital audiobooks from my library's catalog, but I am less than thrilled with that library service as the selection is very small, the lending period is too darn short, and I can only have three items "checked out" at a time (and can't "return" anything early). When it comes to library audiobooks, I think I'll stick with CD books or Playaways as there are more to select from, they circulate for three weeks, and can be returned at anytime before their due date. Susan B. Evans is hosting the Gothic Reading Challenge and I, fool that I am, have signed up to read five books in the coming year. There is nothing better than a great Gothic read – crumbling old castles, mysterious legends, shadowy characters, supernatural beings and unexplainable events, make for some of the most haunting and captivating reading imaginable. A Little Madness – Read just 1 novel with Gothic elements. The Darkness Within – Read 5 novels with Gothic elements. A Maniacal Frenzy – Read 10 novels with Gothic elements. Mad, Bad, and Dangerous to Know – Read 20 novels with Gothic elements. I will be posting reviews as I finish the books -- probably, one every other month.